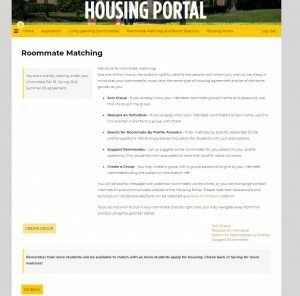 Once you have an agreement with a Confirmed status, Roommate Matching becomes available to you in the Housing Portal. Roommate Matching is an offered service to help you find preferred roommates. These matches should be viewed as requests and preferences only. All roommate requests are subject to availability and UCF Housing reserves the right to assign students as needed. 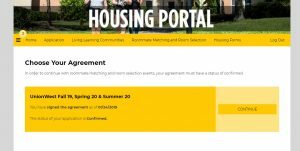 Fall agreements for Academic Main, Towers, Rosen, and NorthView will allow groups made of up to four individuals. Fall agreements for UnionWest will allow students to form a group of up to six students. Agreements beginning in the Spring or Summer semester, irrespective of agreement type, will allow only one roommate request. Note: Under Academic Main agreements, only First Years can match with First Years. Type in your NID and password and click Sign On. 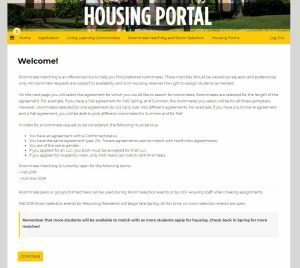 Click on Student Self Service>Housing>Housing Portal. Navigate to “Roommate Matching and Room Selection” on the gold bar. Please read the “Welcome!” page as it will provide general information about roommate matching. Verify that the semester and agreement type are correct. The status of your application should be Confirmed to proceed to Roommate matching. Carefully review information presented at the top of the page. Students should take this opportunity to include a short description of themselves. Provide answers to the Lifestyle Questions. If answers are present, review the responses for accuracy. Use this page to provide information so your future roommate(s) can get to know you a little! Students on the Roommate page have various options. Please use links located at the bottom right of the page to explore the options below. Join a roommate group by using the group name and group password. Review suggested matches or create a group of your own! You may use the web screen name to message students through the Housing Portal. Please select the triple bars on the top left of the gold bar to use our messaging feature. 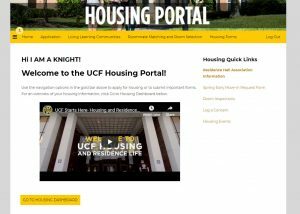 You may follow the above mentioned steps to return to your roommate matches at any point (myUCF>Student Self Service>Housing>Housing Portal>Roommate Matching and Room Selection>Welcome). If you form a roommate group, you are the group leader. As group leader you can remove a roommate, make someone else leader, change the group password or disband the group. 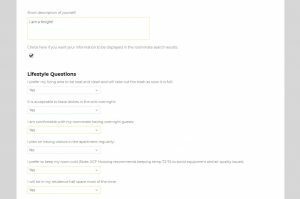 If you do not wish to make any roommate choices, you may navigate away from this process using the gold bar at the top of the page.